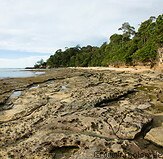 Along the coast of the Similajau national park there are many rock formations. Some of these originated from geological processes, others are former coral reefs which emerged to the surface. It is possible to walk all the way along the rocks from the beaches to the north back to the park headquarters.